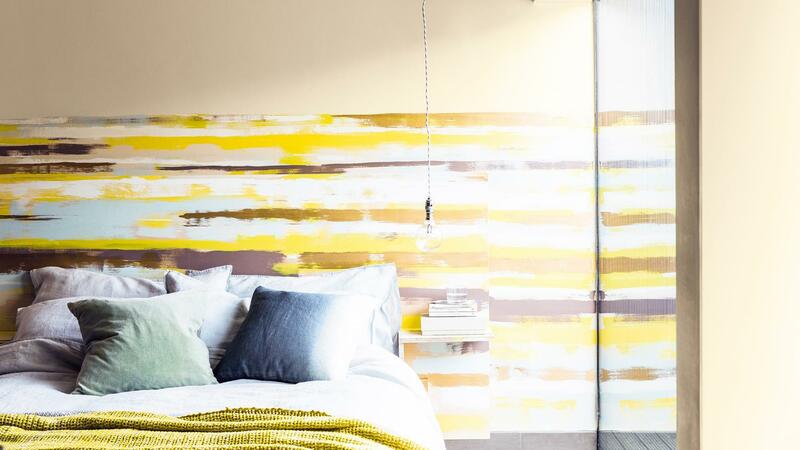 Layer gorgeous colours from Dulux for a striking blurred stripe effect. Paint two coats of your chosen base colour. This will give you a great canvas to work from. Use chalk to mark out the width of your design – this is where you’d like your striped design to begin and end on the wall. Your design can be as large or small as you like – we’ve used the width of the bed to base our design around. Mark out these two horizontal spots on the wall with chalk (we recommend you use the same colour as one of your paint colours – this will make it easy to paint over). Now, here’s the clever trick. Once you’ve marked your two horizontal spots, measure enough string to stretch between these marks on the wall. Run your chalk along the length of the string and then tape each end to the spots on the wall. Give the string a good pluck – you’ll find that you’re left with a chalk mark along the wall. This will give you a guideline to follow and make the painting a bit easier. Repeat steps two to four, creating lines with chalk at 50cm intervals down the wall until you’ve got the size of the design that you want. Now, you’re all set to begin painting! Use a small amount of paint on your brush, and paint in long, sweeping brush strokes, following the chalk guidelines you’ve made. You don’t need to apply too much pressure, as the idea is to get a beautiful wispy effect. You can add as wide a colour palette as you like, and use different sized brushes to create stripes in different widths. The only rule is to keep the lines horizontal.